Flashback September 11, 2014: “I don’t think anyone has her,” one blue-uniformed student nurse says to the other when Mom and I stop to chat on our way to the sing along. “Nothing the matter with that!” Mom slingshots back. Either they don’t hear her or they choose to ignore her. “What’s her name?” the other blue-uniformed student nurse says to me, as if my mother didn’t exist. Her spoon clinks as she stirs her coffee. I bend down next to Mom’s ear. “What’s your name Mom?” I ask. My mother has no choice but to look up at them. They’re twice her height because she’s in a wheelchair and they’re standing. They’d be taller even if she stood up – she’s smaller in stature than she once was. Osteoporosis, Alzheimer’s and now cancer have compressed her body. But her spirit is undiminished; she’s a towering presence in a shrinking container. My guess is they’re about one-fifth her age: young and quick, smooth and pretty and maybe thinking they’re smarter than she is. But she knows her name. “Patty Macaulay,” she says. Strong. Fierce. A force to be reckoned with. She leans forward in the chair. Looks like she might pounce. “Watch out girls,” I think to myself. She’s told them her name, but they don’t know who she is. I do. I see her in bits, pieces and fragments, and in her entirety. I came from inside of her. We’ve had ups and downs and bad hair days. I may know her better than she knows herself. She is Patty Macaulay who organized the other kids on the block to shovel snow in winter when she was a mere child: she got the jobs, they did the work. She’s the one who won so many “tries” at the corner candy store that the owner didn’t allow her to pick lots for prizes anymore. She’s the once-aspiring actress who organized plays in which she starred and charged her contemporaries clothespins to watch and her father always said she had St Vitus dance because she couldn’t sit still for more than a minute; she still can’t. She is Patty Macaulay who didn’t get to finish high school because she and her older sister Jean had to go to work to help support her family and she wore blue velvet when she married a young man named Don whom she met in the bowling league at Northern Electric which became NorTel the stock market darling that went bankrupt which is ironic because their marriage also eventually collapsed after decades of success but long before it did she got pregnant four times and only had two children because the other two never got a chance at a first breath and when she miscarried the second time we almost lost her to associated complications when she was thirty-four and I was six and I never went to visit her in the hospital then but I’m making up for it now by being with her every dementia day. She was a great hostess who threw amazing parties and made the best lasagna and Caesar salad with homemade croutons. She made blueberry muffins with those little wild blueberries from Lac St Jean which she bought specially at the Atwater market in Montreal. She taught me how to make spaghetti sauce, homemade soup and dill pickles. 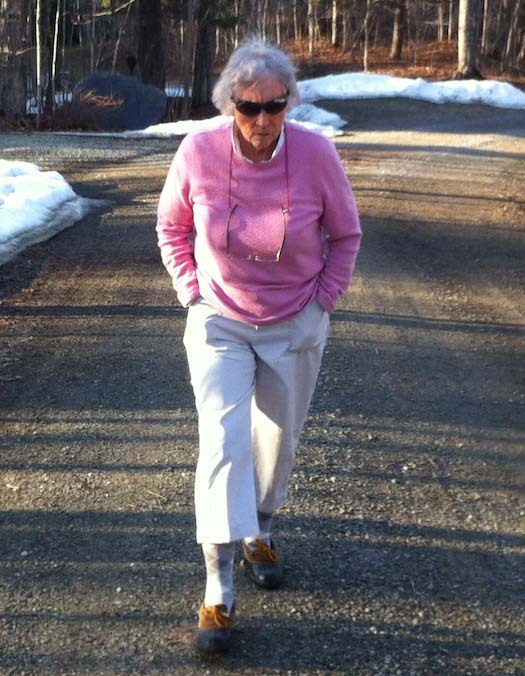 She taught skiing too, and she loved teaching the kids best; they called her Madame Pat and they wanted her to take them on the “big hill” and one little boy who had cystic fibrosis always remembered her and she always remembered him until he died when he was twenty something. She walked, golfed, gardened, and swam. She collected antiques and was house proud. She fed the birds. She hugged her cat. She gave away countless baskets full of green beans and lettuce and tomatoes from her vegetable garden. She watered her window boxes from rain barrels. She matched people with places so successfully she became the “go to” realtor on Lake Memphremagog long before anyone thought to put “go” and “to” together to create an adjective and she had movie stars and rock stars and corporate magnates as clients. 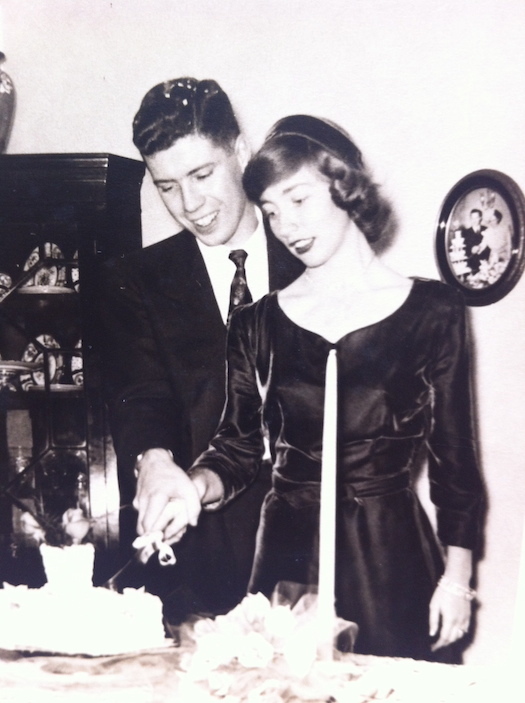 She adored dancing, and was the life of any party she was at. She still sings and knows the words to hundreds of songs today’s student nurses haven’t heard before and neither had I before Alzheimer’s came to visit uninvited and never left. She’s fierce, funny and wise. She loves to laugh and play in the moment when she can. She loves me and pink and her family and she’s my mother and that’s not even the half of it believe me. She’s not a thing or an assignment for someone to “have” no matter how sick or old her body might be. “I think someone has her,” says the first student nurse to the second after Mom tells them her name. My hands tighten on the handles of the wheelchair. My jaw clenches. Somehow I remain silent. Mom doesn’t; Alzheimer’s made off with her filter long ago. “I don’t need any…any…any…any…any…” she machine guns back in slow vocal motion as the thought in her brain gets lost on the way to her mouth. “You don’t need anybody?” Student nurse number one fills in helpfully. Bingo! “No. I don’t need you,” suddenly Mom is as clear as a blue sky in autumn. Student nurse number two says something neither Mom nor I can catch. “What did she say?” Mom asks me. “I don’t know Mom,” I answer as I disengage the wheelchair brakes. “It doesn’t matter.” We roll down the hall to the sing along leaving youthful arrogance and ignorance behind. Amazing as always Susan your post and the comments along with the poetry in return. I love it when Maureen gives it to them: sometimes they scarper because they can’t take what their patronising behaviour deserves. Goodness knows how they will respond when she really begins to let them have it! I miss you too Hun, so much! But I am so privileged to be sharing yours and your Mum’s journey with this terrible disease. I just know that you are, as always, impacting so many lives with your stories. You are such an amazing human being, and an inspiration to me daily! Amazing poetry in response to another insightful and heart wrenching experience with Madame Pat. Hugs. I am reminded of this poem…. Oh Lynn! Cried all the way through. That’s exactly it captured in rhythm and rhyme: the poetry of a life. Love you, SO miss you and your grounded good sense and deep compassion.